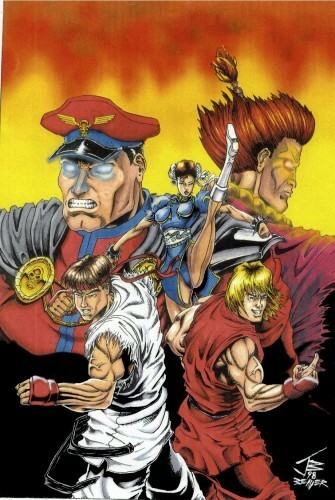 Ancient Street Fighter 2 pic with the usual characters that you see in Street Fighter art: Ryu, Ken, Chun-Li, Bison and Akuma/Gouki. Drawn and colored while in Charlotte, NC, I couldn't get to a place that did cardstock copies, which allow you to airbrush on them without curling up. And now you know why that 'firey' background, meant just as a placeholder until I decided to move on, looks so horrible. The plan was to have Bison and Gouki's auras almost battling each other, but that never came to be. Oh well.